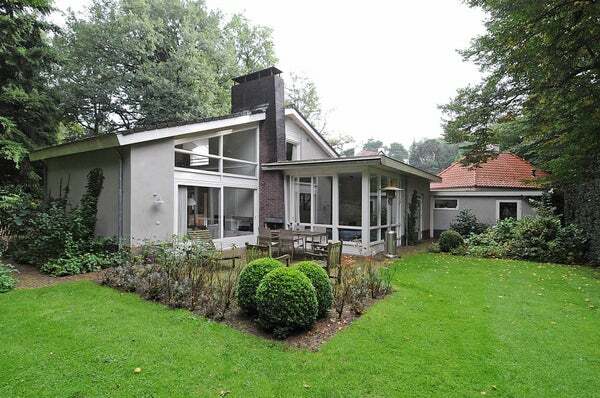 Modern, spacious bright villa with surrounding garden located in a popular neighborhood in Baarn. Beautiful sunny garden with several terraces and lots of privacy and a remote controlled entry gate. There is parking space for 3 cars on site. Convenient location near schools, facilities, forests and highways. Entrance, spacious hall, French doors to spacious living room with high ceilings, fireplace and sliding doors to terrace. Luxury diningkitchen with all appliances. TV room with sliding doors to terrace, study area. Rear entrance with hall, toilet, spacious office with doors to garden, utility room. Modern bathroom with underfloor heating, bathtub, shower, sink, and toilet. Adjacent bedroom with wardrobe and doors to the terrace. Spacious light landing with skylights, large loft, 3 bedrooms, 2nd bathroom with walk-in shower, sink and toilet.